Tony Stark's band of government-sponsored superheroes has been taking heavy fire lately, and it's come from an unexpected source. When MVP passed through the training program, he was every bit the ideal candidate to join the Initiative. But when he was suddenly killed in action during an early mission, the brass didn't want to lose an opportunity to spotlight this perfect example of the kind of good their program can produce. They cloned him, multiple times, with much of the team kept out of the loop, and now one of those clones has gone mental. With a dangerous new weapon strapped under his arm, the duplicate (now known as KIA) has cut a bloody path through the Initiative's ranks, slaughtering trainees and full-fledged members alike. With the fight against KIA now in their past, this month the supervisors of the Initiative are dealing with, perhaps, a more unsettling foe: their explanation-hungry superiors. After the wealth of raw action that preceded it, this month's issue may seem to be a drastic change of pace. The Initiative #12 spends most of its time focused on the personalities and relations of the team's members – how they respond to authority, how they interact with one another, their public strengths and private weaknesses... it's a good chance for new readers to get to know the squad, but it's not particularly exciting. The issue's tone is very strange for a mainstream superhero book, although I can't quite decide whether that's a good thing or a bad thing. On one hand, it's sculpting characters who were once little more than C-List into well-rounded, deep, original individuals. On the other, it's a far cry from the bravado, super-powered firefights and would-be world rulers that many might expect from a series bearing the Avengers namesake. It's the mainstream superhero series that looks and reads more like an indie comic. In the same vein as Power Pack's Gurihiru Studios, Steve Uy provides every aspect of the artwork for this month's Initiative himself – everything from pencils to inks to colors goes through his hands, and that makes for a tight, cohesive visual identity. It's important that Uy handle the colors himself, because his style is so reliant on the palette to provide shading that it could prove to be a real headache in someone else's hands. His actual artwork is cut down to the very basics, with a heavy emphasis on composition and posturing, and actual linework used only as a last resort. While this serves to keep the page airy and appealing, that benefit doesn't come at the cost of his characters' individuality. If anything, it gives the artist a greater opportunity to focus on the shape and size of his cast – no two look even remotely alike, neither in facial expression nor in build. If you're familiar with the work of the Luna Brothers on Ultra or Girls, this is a very similar bag of tricks, but I think Uy is doing a better job of it. It's a nice approach that doesn't fall into any of the traps that one might expect, and the book benefits from its presence. This month's Avengers: The Initiative is the black sheep of the Avengers family. It seems more concerned with what happens after the disaster than how it was averted in the first place, which is certainly a unique perspective for a mainstream superhero book. 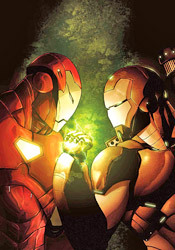 While co-writers Dan Slott and Christos N. Gage display a tendency to overload a page with dialog, it's at least compelling reading with the noble goal of expanding and enhancing the team's members. Matched with Steve Uy's distinct artwork, the duo delivers a book that's unlike any of the other post-Civil War books Marvel's delivered thus far. Borrow it from a friend and see if it's your cup of tea... The Initiative is worthy of a long look.